Happy Monday to all! We didn’t have any trip last weekend as my husband was busy lately. But on Sunday night, we had a wonderful dinner. At first, we just wanted to try a Japanese restaurant near our home that we’ve never visited before. The place is so cozy. We also get good food and good price there. I was really amazed with the affordable prices. It’s a pity I forgot to bring the camera. I asked my husband to have lunch at the same restaurant another time. The eating place has nothing in blue. For Blue Monday, I share some blue decoration items at our home. 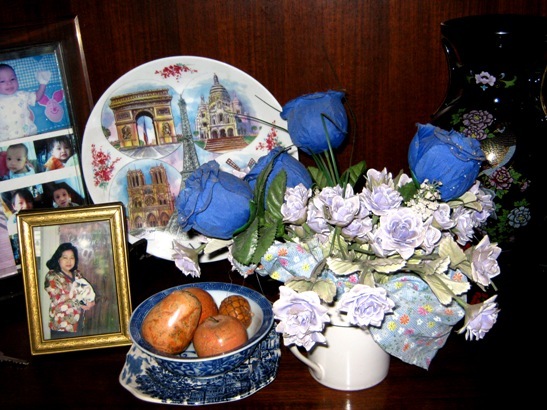 I have artificial blue roses that I bought ten years ago to decorate our wedding car. Every time I see these flowers, I always remember when my SILs and I decorated the car in the middle of the night.